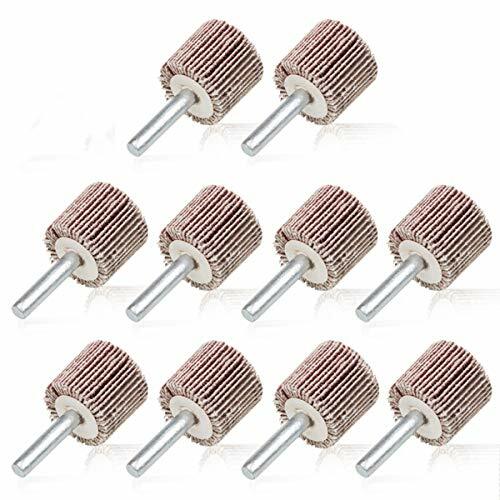 10 Pack 1" x 1" x 1/4" Shank Mounted Flap Wheels, 80 Grit Aluminum Oxide Mounted Abrasive Grinding Tool Great for removing rust,paint on wood or metal. Use for grinding and polishing flat or contoured surfaces . Great for removing rust,paint. 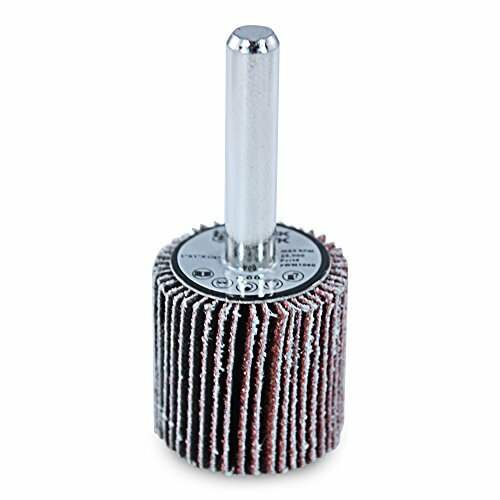 If you're grinding, blending, or polishing pipes, tubing, or other compact, irregular surfaces, the 2" x 1" x 1/4" Mounted Flap Wheel with shank by Black Hawk Abrasives is the abrasive you need! 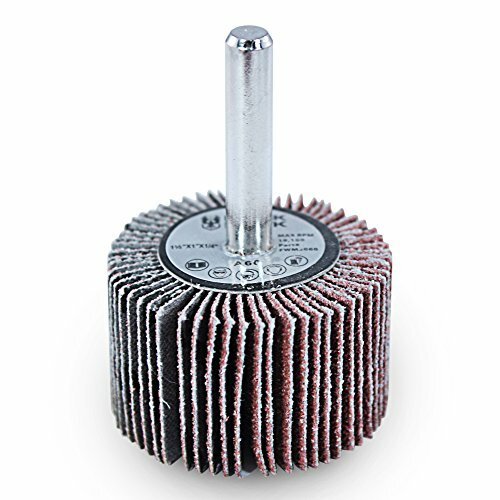 Made with premium aluminum oxide coated, x-weight cloth flaps arranged in a circular fan shape around the center straight shank, these wheels are built to last and provide an extra element of flexibility. As the flapper wheel is used the flaps wear down, exposing new sharp abrasive material which extends the life of the tool and provides a consistent cut. Moreover, the fan shape of these 2 inch flap wheels allows for added flexibility which makes them ideal of irregular shaped work pieces especially work within cylindrical pieces like pipes and tubes. 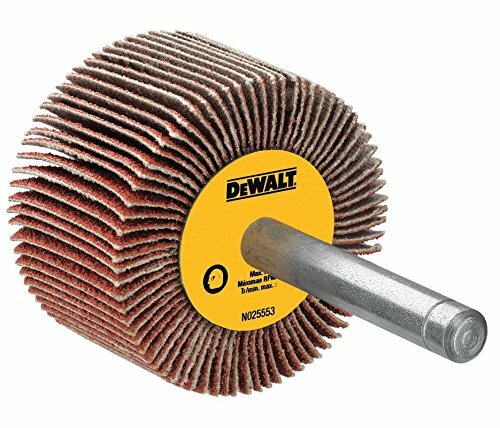 The 1-1/2" x 1" x 1/4" Mounted Flap Wheel with shank by Black Hawk Abrasives are the ideal choice for polishing, flash removal, light grinding, deburring, scale removal, blending, and graining in small spaces, such as the inside or outside of pipes or tubes. 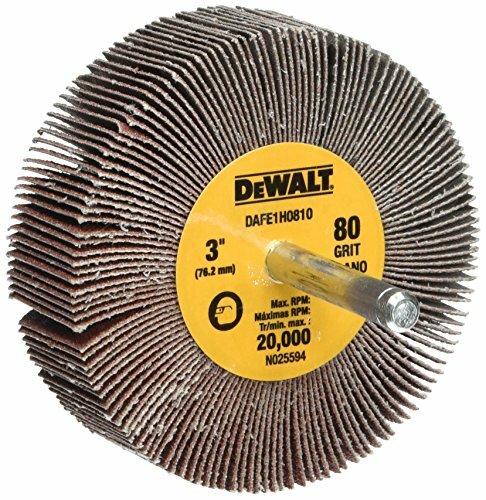 These flapper wheels are made up of aluminum oxide abrasive flaps that are arranged in a fan pattern around the straight spindle shank of the flap wheel. 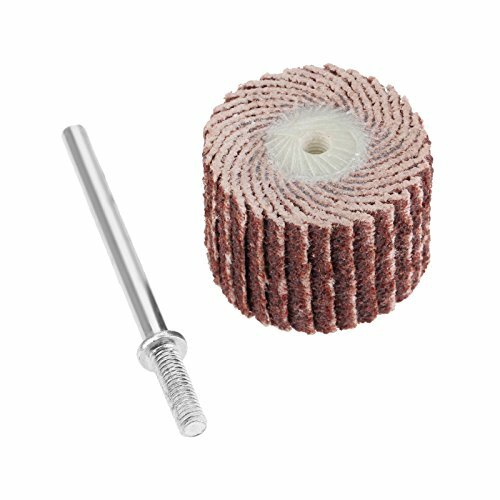 This fan design allows the premium, x-weight, abrasive cloth to wear away during use, exposing new aluminum oxide abrasive grains. This action of providing a continuous supply of fresh aluminum oxide grains results in consistent grinding throughout the use of the flap wheel. Additionally, the flap design allows flexibility so that the wheel can contour around work pieces and smooth rounded or irregular shaped surface. 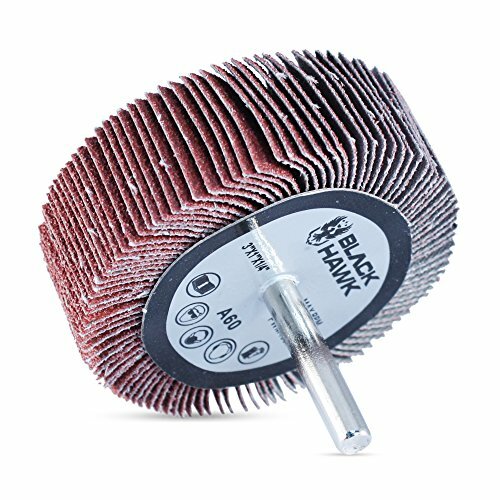 The 1" x 1" x 1/4" Mounted Flap Wheel with shank by Black Hawk Abrasives are the perfect abrasive for deburring, flash or scale removal, light grinding, blending, or polishing in hard to reach places, such as tubing or piping. Each flap on these flap wheels is constructed using x-weight cloth that is coated and resin bonded with aluminum oxide grains. These flaps are affixed to a straight spindle, in a fan like pattern, which allows the flap wheel to grind quickly while exposing new abrasive grains, thus extending the life of the abrasive. The fan like pattern of the abrasive sheets also allows the wheel to have some flexibility and contour around work pieces with ease. 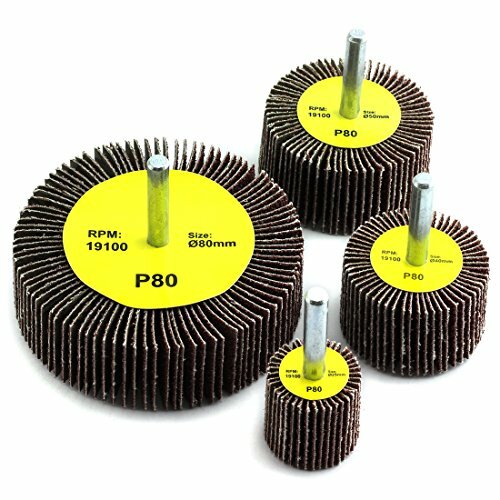 These flapper wheels are able to grind along curves and are especially helpful when used to grind, blend or polish in tight spaces such as the inside or the outside of tubes. 4.5.The drill should rotate clockwise Opposite to the sandpaper sheet. EASY TO INSTALL: The mounted flapper wheel suitable for most of drill, The drill should rotate clockwise. POLISHING A LOT OF THINGS:The mounted buffing flap wheels used for grinding irregular surface of iron, stainless steel, alloy products. GOOD EFFECT:Grinding your faded items back to like new condition. The variable speed drill prevents the pad from rotating too fast Rotating speed should be control below 19100RPM. It also extends the service life of the padding materials. Diameter: 2 Inch ; Wheel tread width:1 Inch; Handle diameter: 1/4 Inch; Handle length: 1-1/5 Inch. 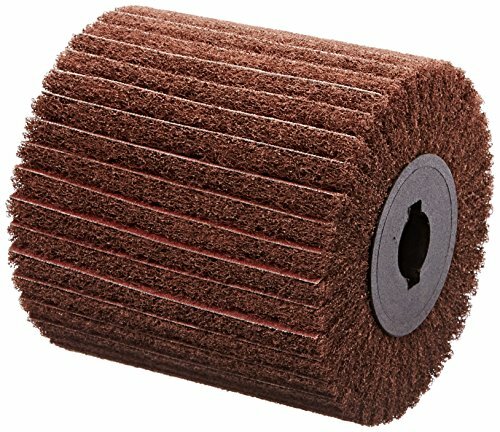 Please dip in 60 degree hot water for 2-3 minutes before using, make the sandpaper fully damp, to reduce dust while polishing and the sandpaper will be hard to break, enhancing more than 30% service life, lower loss, longer service time. 1. Manual measurement, please allow reasonable error. 2. Please use within the allowed installation speed. 3. Wear safety equipment to operate, wear protective overalls, safety mask and protective gloves. 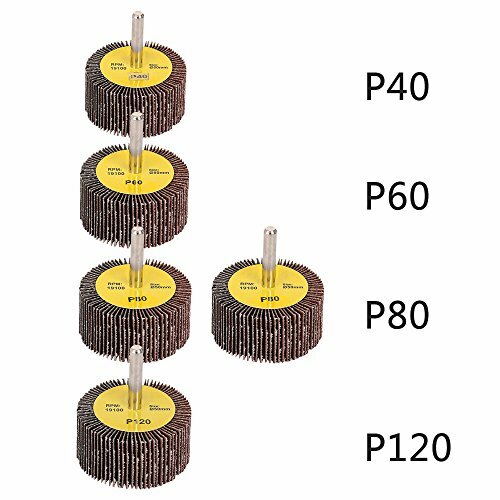 Package: Pack of 5pcs flap wheel with shank, 5 kinds grit: 40/60/80/120/240, to meet all kinds of grinding, polishing application requirements. Size: Wheel diameter approx. 2 (50mm), height approx. 1 (25mm), shank diameter approx. 1/4 (6mm). 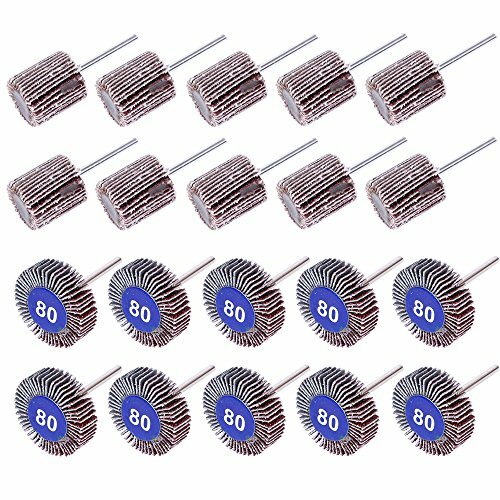 Material: High quality aluminium oxide, strong grinding force, great polishing effect, can be used as a set with Dremel Rotary Tools, Straight Angle grinder, pneumatic tool, electric drill, pneumatic drill, bench drill etc. MAX RPM: 25000, easy to install, suitable for grinding and polishing of metallurgy, machinery, stainless steel, wood products, furniture, hardware, plastics, melamine, textile etc. industry. Use: Applied to all kinds of complex surfaces of metals and nonmetals, polishing and finishing of deep hole, especially suitable for concave convex surface and side grinding, polishing, repairing weld, deburring and rust removal etc. 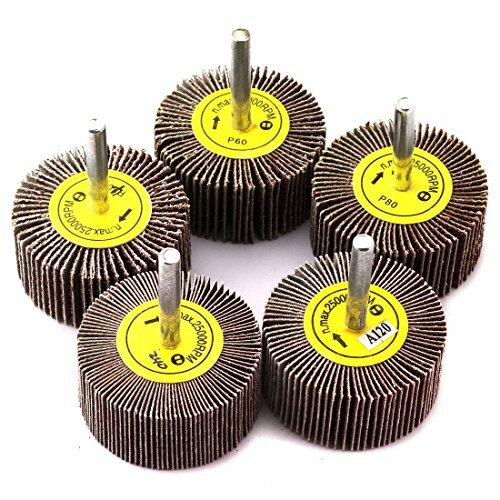 Package: Pack of 5pcs flap wheel with shank, 80 Grit, 4 kind common-use sizes, to meet all kinds of grinding, polishing application requirements. Size: 4 wheel diameter: 1 (25mm), 1-1/2(40mm), 2(50mm), 3(80mm), wheel height 1 (25mm), shank diameter approx. 1/4(6mm). MAX RPM: 19100, easy to install, suitable for grinding and polishing of metallurgy, machinery, stainless steel, wood products, furniture, hardware, plastics, melamine, textile etc. industry. 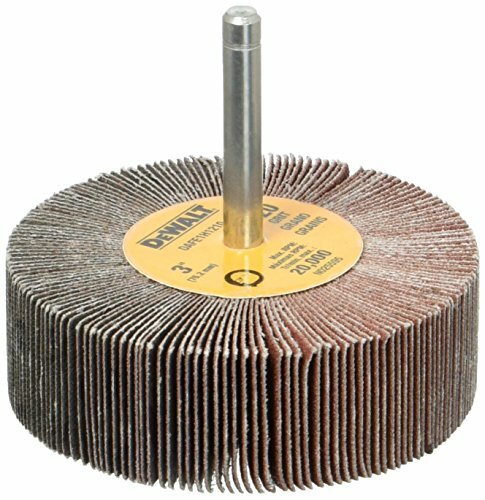 If you're grinding, blending, or polishing pipes, tubing, or other compact, irregular surfaces, the 3" x 1" x 1/4" Mounted Flap Wheel with shank by Black Hawk Abrasives is the abrasive you need! 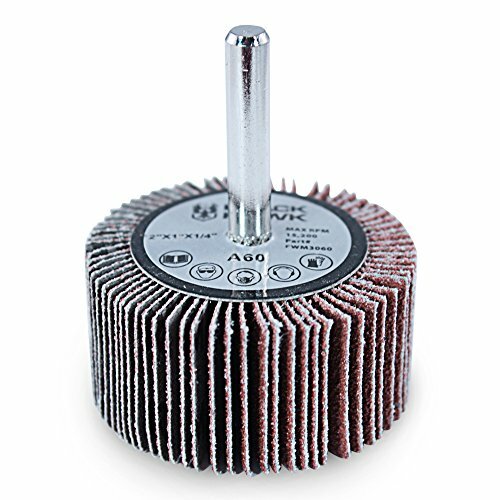 Made with premium aluminum oxide coated, x-weight cloth flaps arranged in a circular fan shape around the center straight shank, these wheels are built to last and provide an extra element of flexibility. As the flapper wheel is used the flaps wear down, exposing new sharp abrasive material which extends the life of the tool and provides a consistent cut. Moreover, the fan shape of these 3 inch flap wheels allows for added flexibility which makes them ideal of irregular shaped work pieces especially work within cylindrical pieces like pipes and tubes. Special fused aluminum oxide grinding plates combined with grain layered nylon fleece. Work smoothly and provide uniform surface treatment effect. Waterproof and oil-resistant. Safe and wear-resistant. Suitable for Professional salon, Studio or Home Use.